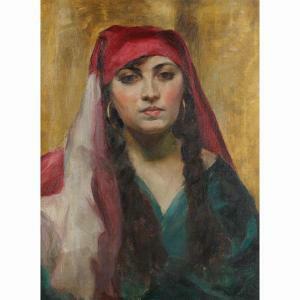 Find artworks, auction results, sale prices and pictures of William Forsyth at auctions worldwide. 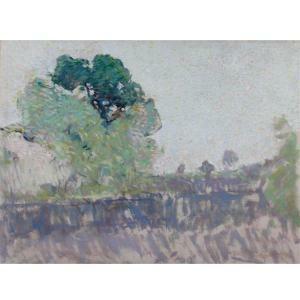 William Forsyth (American; 1854-1935) oil on canvas Landscape painting signed "W Forsyth 12." Good condition. Forsyth an American impressionistic painter studied at the Royal Academy in Munich and then returned home to paint Indiana landscapes. As a member of the Hoosier Group, Forsyth's paintings are exhibited in private and public collections around the world painting 39 1/2 x 30"W frame 48"x 37"
Timed Auctions are a new and exciting way to buy quality lots from exclusively participating auctioneers. Place your top bid to be executed in confidence or get notified when you've been outbid and come back to bid again. Our Timed Auctions are convenient, secure and designed to enhance your bidding experience. P.S. Remember to refresh the page to see the current bid, time left, and if the lot closing was extended. 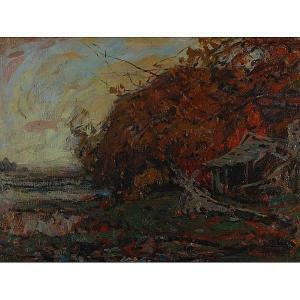 Lot 3: William Forsyth, (American, 1854-1935), Autumn Landscape, Oil on board, 17 1/2" x 24"
The Artfact Live! SecureBid™ feature ensures you never overpay. Without disclosing your limit to anyone, SecureBid™ places your bids automatically, up to one increment higher than the last in-room bid or preset reserve, until we have reached your maximum bid. William J. Forsyth, (1854 - 1935), Orientalist portrait of a lady, oil on canvas, 26 1/2" X 19 1/2". Possibly from the Munich series. Provenance: From a private Indianapolis collection. Previously acquired in 1969 from Forsyth's Brown County attorney, and was gifted by Forsyth in return for legal services ca. 1920s. 26 1/2" X 19 1/2". Any condition statement is given as a courtesy to the client. We are offering our professional opinion. We attempt to submit condition reports in the description. However, the absence of a condition statement does not imply that the lot is in perfect condition or completely free from wear and tear, imperfections or the effects of aging. Antique Helper, Inc., et al shall have no responsibility for any error or omission regarding an item's condition.